The PTWS 610 model is generally preferred if manual sampling is the chosen option. 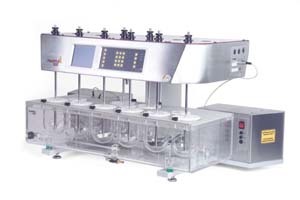 The six in line (plus two stirred extra vessels) format places all vessels in front of the user. Also the "staggered start" option for each stirrer is a user friendly design as it allows manual sampling without any timing problems. As with the PTWS 310, the instrument offers testing method filing, user access administration, auto positioning of the vessels inside the water bath. The U-shaped Plexiglas (perspex) water bath itself is decoupled so as to virtually eliminate any vibration from the drive and heater housing by integrated shock absorbers. A large LCD display, traffic light warning and alphanumeric keypad are also included as the user and access administration and a testing method filing system. The new Mono-ShaftÔ design means you only change the stirrer inserts. The shafts are simply placed into the drive system, calibrated once and then remain there with no need for further adjustment.